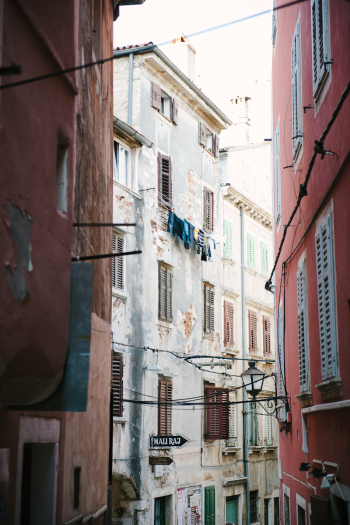 It was yet another beautiful morning in Rovinj Croatia, as warm sunlight streamed through our bedroom window bringing sounds of laughter from the early morning fishermen. 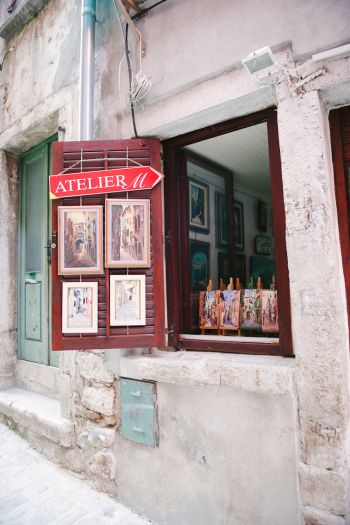 Slowly the town awakened and the many local artists opened their little boutiques and craft stores. We spent our morning walking the meandering alleys with shiny cobblestones, polished by the many people who have walked the streets in the hundreds of years since being settled in the sixth century. 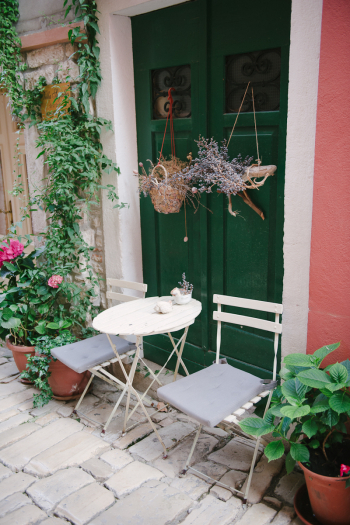 On our way through the pedestrian-only streets of historic old town, we passed lots of little shops and galleries, a few jewelers, cafes and restaurants, and a handful of cats relaxing in the sun. Here and there we saw women hanging laundry or carrying baskets of fresh fruit back from the market. By the harbor men were working on their boats or fixing their fishing nets while a few people waited for the ferry to take them to nearby beaches. In the evening, we decided to try one of the restaurants offering seating on the cliffs. Rovinj is known for its seafood but almost every restaurant also offers at least a few other dishes as well. Everything we tried was truly delicious! During dinner, a little crab wandered under our table and pinched my toe, causing me to first jump up and then laugh at the discovery of our little guest from the sea! After dinner, our last stop for the night was Valentino’s, a gorgeous cocktail bar that offered amazingly delicious mojitos and a large variety of other cocktails. 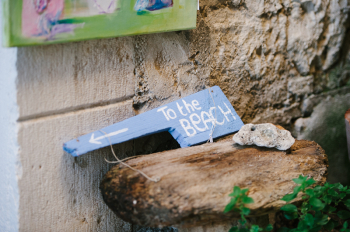 We chose to sit on the rocks overlooking the ocean, but the bar also offers lounge chairs and a VIP area. On the way back to our room we stopped at one of the many small art galleries to chat with the owner. She was enjoying the mild evening with friends and invited us to join them. 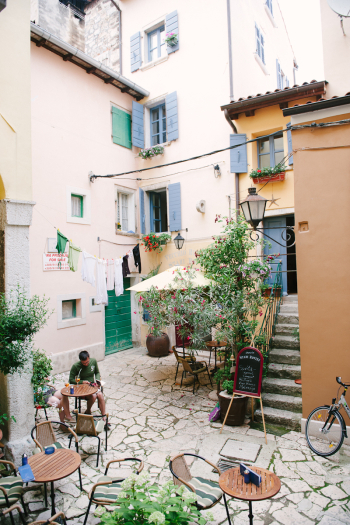 We stayed for a glass of wine and savored the hospitality of Rovinj’s locals. We exchange stories and they told us of how the town has developed and improved its infrastructure over the past few years since becoming a UNESCO World Heritage Site. Finally we said our goodbyes, but not without making a promise to come back for another visit soon! If you stop by, please say hi to Jan from Ivan and Stefanie! 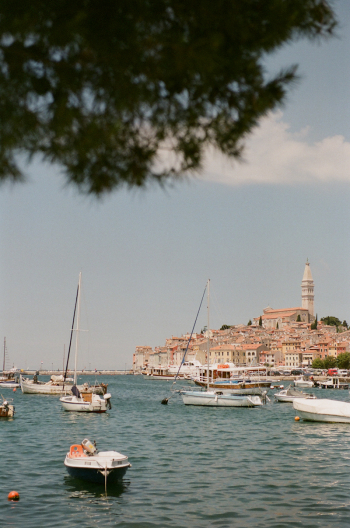 There is a ferry connecting Rovinj with Venice, Italy. The price for an adult (one-way) is about Euro 67 – 72, depending on the season. Round trip tickets are about 120 Euros. Ryanair flies from London Stansted and Dublin to Pula (40km away) several times per week. 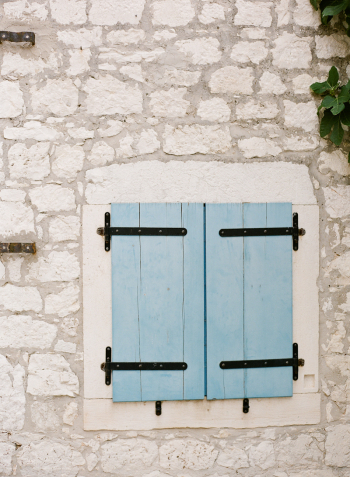 This post makes me so want to go back to Croatia – I absolutely adore this place!